Know your teens’ world in order to have deeper conversations about the things that matter. 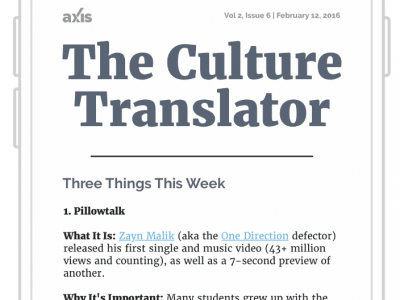 What Is The Culture Translator? A glimpse into what’s influencing teens right now. Insightful perspective on the relevant topics in your teen’s world. A weekly nudge to start conversations about the underlying issues. Do you want even more insight into teen culture? Upgrade to a Premium Subscription to get even more cultural analysis and conversation starters in your inbox every week!